Project enables Gallery to show more than 4,000 works, including some 1,100 new acquisitions; present a greater diversity of special exhibitions; and expand its education programming for the Yale community and the public at large. On December 12, 2012, the Yale University Art Gallery celebrates the grand opening of the renovated and expanded museum. This important initiative, which has been accompanied by parallel growth in the museum’s holdings, has enabled the Gallery not only to enhance its role as one of the nation’s preeminent teaching institutions, but also to join the ranks of the country’s leading public art museums. The $135 million* project has increased the space occupied by the museum from one-and-a-half buildings—the 1953 modernist structure designed by Louis Kahn and approximately half of the 1928 Old Yale Art Gallery, designed by Egerton Swartwout—to three, encompassing the Kahn building, the entire Old Yale Art Gallery, and the contiguous 1866 Street Hall, designed by Peter Bonnett Wight (and home to the Gallery from 1867 to 1928). The project—designed and led by Duncan Hazard, Management Partner, and Richard Olcott, Design Partner, in the New York City-based Ennead Architects (formerly Polshek Partnership)—has united the three buildings into a cohesive whole while maintaining the distinctive architectural identity of each. The expanded and renovated Gallery contains 69,975 square feet of exhibition space, compared to 40,266 square feet prior to the expansion, and occupies the length of one-and-a-half city blocks. The Gallery’s eleven curatorial departments were all involved in planning for the project and in the reinstallation. Designated collection galleries include those devoted to African, Asian, Indo- Pacific, and modern art, located in the Louis Kahn building; art of the ancient Americas, ancient art, European art, coins and medals, photography, and contemporary art, located in the Old Yale Art Gallery; and American paintings and sculpture and American decorative arts, located in Street Hall. Works on paper are integrated into a number of the galleries, and the reinstalled museum also features a number of study galleries, including one on the arts of Islam; the new Nolen Center for Art and Education; and three special-exhibition galleries. The Yale University Art Gallery, in New Haven, Connecticut, has completed major work on its renovation and expansion and commenced installation of the museum’s esteemed collections. The revitalized Gallery will open to the public on December 12, 2012. The expansion project, which has been accompanied by parallel growth in the museum’s holdings, will transform the visitor experience, enabling the Gallery not only to enhance its role as one of the nation’s most prominent teaching institutions, but also to join the ranks of the country’s leading public art museums. The expansion and renovation have been designed and led by Duncan Hazard and Richard Olcott, partners in the New York City-based Ennead Architects. Mr. Hazard is also lead architectural planner for the University’s Master Plan for the Yale Arts Area, of which the Gallery renovation is a key element. The Gallery’s $135 million* project has increased the space occupied by the museum from one-and-a-half buildings – the 1953 modernist structure designed by Louis Kahn and approximately half of the 1928 “Old Yale Art Gallery,” designed by Egerton Swartwout – to three, encompassing the Kahn building, the entire Old Art Gallery, and the contiguous 1866 Street Hall, designed by Peter Bonnett Wight (and home to the Gallery from 1867 to 1928). The project has united the three buildings into a cohesive whole while maintaining the distinctive architectural identity of each. *This figure includes the renovation and restoration of the Louis Kahn building, Old Yale Art Gallery, and Street Hall. The Yale University Art Gallery, in New Haven, Connecticut, the oldest and one of the most important university art museums in America, is in the final phase of a renovation and expansion that will transform the visitor experience of both the museum and its esteemed collections. The project will enable the Gallery not only to enhance its role as one of the nation’s most prominent teaching institutions but also to join the ranks of the country’s leading public art museums. The expanded Gallery will open in December 2012. The $135 million* renovation increases the space occupied by the Gallery from one-and-a-half buildings—the 1953 modernist structure designed by Louis Kahn and approximately half of the adjacent 1928 Old Yale Art Gallery, designed by Egerton Swartwout—to three. The project began with the critically acclaimed restoration of the Kahn building and continues today with the renovation and expansion of the Old Yale Art Gallery and the contiguous 1866 Street Hall, designed by Peter Bonnett Wight and home to the Gallery from 1866 to 1928. It unites the three buildings into a cohesive whole while maintaining the distinctive architectural identity of each. When complete, the expanded gallery will contain 69,975 square feet of exhibition space (enlarged from 40,266 square feet prior to the expansion) and will occupy the length of one-and-a-half city blocks. With new areas for exhibitions and object study, combined with a comprehensive plan for public and educational programming, the project will vastly increase access to the Gallery’s encyclopedic collections. The renovation and expansion have been led by Duncan Hazard and Richard Olcott, partners in the New York City–based Ennead Architects (formerly Polshek Partnership Architects). Mr. 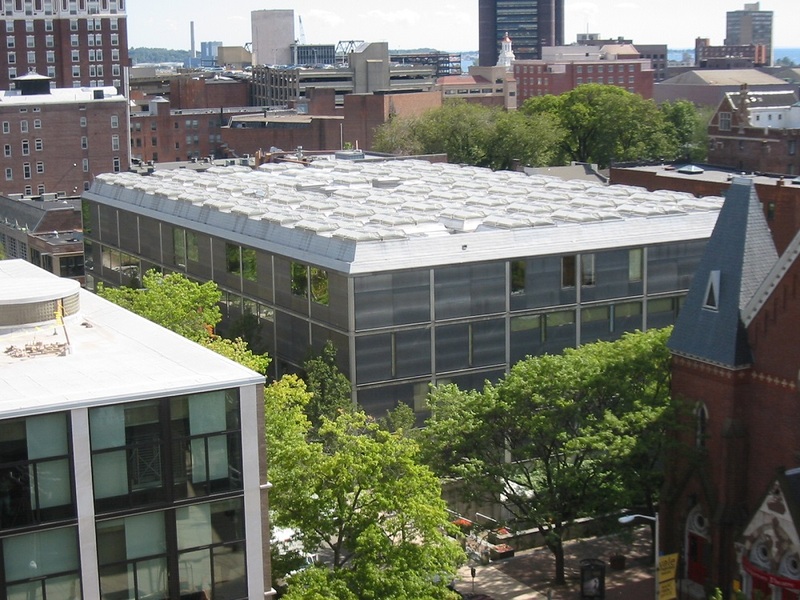 Hazard is also the lead architectural planner for the University’s Master Plan for the Yale Arts Area, of which the Gallery renovation is a key element. Planning for the renovation of the Gallery began in 1998, and the first phase of construction—on the landmark Kahn building—commenced in 2003. Completed in December 2006, the building, which is widely considered to be the architect’s first masterpiece, was returned to its original purity and integrity, including recapturing expansive, unobstructed vistas while introducing up-to-date building systems. The project continues today with the renovation and restoration of both the Italianate Gothic Old Yale Art Gallery and the Ruskinian Gothic Street Hall, which was most recently occupied by the University’s History of Art department. Work on the buildings has included restoration of the interiors of Street Hall—including the preservation and reuse of historic architectural elements and finishes—as well as of the masonry façades of both of the older buildings. To ensure that the reconfigured Gallery provides both an up-to-date environment for art and a seamless visitor experience, the architects have also introduced a new stairway and elevator to unify circulation patterns into a logical flow, upgraded the mechanical systems, and improved the thermal performance of the exterior walls, among numerous other undertakings. In addition to the work on the existing buildings, the architects have added a rooftop structure that provides a suite of new temporary-exhibition galleries. Clad in zinc and glass, this addition is set back from the perimeter of the roof, creating a sculpture terrace. On completion of the expansion, the Gallery will be able to install a vastly larger portion of its collections than heretofore possible. The current installation of European art displayed some 135 works; the new galleries will feature about 350. Moreover, visitors will also see numerous objects that have never before been shown at the Gallery. This will include a new installation of Indo-Pacific art, comprising ethnographic sculptures from Southeast Asia, medieval Javanese gold, and textiles from Indonesia, which will establish the Gallery as one of the country’s leaders in this field. An extensive new installation of coins and medals has been enabled by the transfer of the University’s Numismatics Collection to the Gallery from Yale’s Sterling Memorial Library. A rare group of late 19th-century lunettes and ceiling murals— donated to the Gallery after they were removed from the Collis Huntington mansion on Fifth Avenue when it was demolished in 1926—have been restored and will be on view for the first time. In addition to new displays, recently acquired objects from all collection areas—including Japanese screens, African antiquities, Roman portraits, 19th-century American painting, and contemporary sculptures, among many other examples—will be on view throughout the Gallery. Gallery curators and the architects have collaborated in an effort to ensure that the new galleries meet the needs of the art that they will house. The display of ancient art, which will be installed in one of the first exhibition spaces seen by visitors after entering the building, will include a separate room devoted to the Gallery’s important and renowned collection of artifacts from the ancient city of Dura-Europos, in present-day Syria. The galleries for modern and contemporary art will have 16-foot ceilings and vast interiors to allow for large-scale works, while European art will occupy a series of more intimate galleries. Although the pattern of circulation through the galleries will be uninterrupted, visitors will encounter a number of spaces designed for quiet contemplation. The new Gallery will include eight classrooms, enhancing the ability of professors across disciplines to teach from the collection, and the Nolen Center for Art and Education will serve as a major new resource for teaching and learning. This nearly 5,000-square-foot facility on the ground floor of Street Hall will enable the Gallery to greatly expand its education programs and will be dedicated to serving both Yale students and general visitors. The Yale University Art Gallery renovation and expansion has been fully financed by gifts from individuals and foundations. The total cost of the project, including work on the Kahn building, the Old Yale Art Gallery, and Street Hall, is $135 million ($44 million, Kahn building, 2002–6; $91 million, Old Yale Art Gallery and Street Hall, 2007–12), with the earliest pledges made in 1998 and the most recent gift committed in December 2011. In keeping with Yale’s policy, all gifts and pledges for construction were secured prior to breaking ground for the final phase of the project in October 2009. Gifts and pledges for the reinstallation of the collection continue to be made to the Gallery. Gifts for the project have ranged greatly in size, with multiple leadership gifts at $10 million and above; numerous additional gifts have been designated to create endowment funds for staff and programs, ensuring the long-term success of the Gallery. The Yale University Art Gallery was founded in 1832, when patriot-artist John Trumbull donated more than 100 paintings to Yale College and designed a gallery to house them. Since then, the Gallery’s collections have grown to number more than 200,000 objects from around the world, ranging in date from ancient times to the present day (see “Collections Overview”). Among these holdings are the celebrated collections of American paintings and decorative arts; outstanding collections of Greek and Roman art, including the artifacts excavated at Dura-Europos; the Jarves, Griggs, and Rabinowitz collections of early Italian paintings; masterpieces of European art, including works by Hans Holbein, Frans Hals, Peter Paul Rubens, Eugène Delacroix, Édouard Manet, and Vincent van Gogh; Asian art; African art from diverse cultures, including a stellar group of nearly 600 objects donated to the Gallery by the late Charles B. Benenson, b.a. 1933, and around 200 African antiquities from the SusAnna and Joel Grae collection; sculptures and textiles from the new Department of Indo-Pacific art; art of the ancient Americas; the Société Anonyme Collection of early 20th-century European and American art; and a growing collection of modern and contemporary works. The encyclopedic collections provide an invaluable resource for the national and international world of artists, art enthusiasts, scholars, and museum professionals. They are used not only to educate Yale students in all subject areas, but also to inspire and increase understanding of great works of art among the wider public, from schoolchildren to adults. The Gallery has remained open throughout its 14-year renovation project, and since 2006 it has continued to present an active program of special exhibitions and permanent-collection installations in the Kahn building. As part of the museum’s efforts to share the collection with a broader public, it has also organized traveling exhibitions, which are presented at museums across the country. These have most recently included an exhibition drawn from the Gallery’s holdings of objects from Dura-Europos; Robert Adams: The Place We Live, A Retrospective Selection of Photographs, spanning the American photographer’s 45-year career; Sol LeWitt: A Wall Drawing Retrospective, a long-term installation of work from the Gallery’s collection at the Massachusetts Museum of Contemporary Art (MASS MoCA) and organized by the Gallery, MASS MoCA, and the Williams College Museum of Art; and Société Anonyme: Modernism for America, drawn from the exceptional collection founded by Katherine S. Dreier, Marcel Duchamp, and Man Ray. The latter will be the inaugural special exhibition on view in the renovated Gallery. The Gallery’s renovation and expansion project is an important element of Yale University’s Master Plan for the Yale Arts Area, developed in the mid-1990s to facilitate the preservation of important historic buildings while improving and expanding arts facilities. The ambitious Master Plan for the Yale Arts Area is intended to benefit not only the University community but also the people of New Haven and visitors from across the nation and around the world. The Gallery is located at 1111 Chapel Street, in New Haven, Connecticut. Hours are Tuesday through Saturday, 10 am to 5 pm (Thursday until 8 pm, September through June); Sunday, 1 to 6 pm; closed Mondays and major holidays. It is open to the public, and admission is free. For additional information, the public may call 203.432.0600, or go to www.artgallery.yale.edu. NEW YORK – The completely renovated and expanded Paul Rudolph Hall at Yale University, designed by Gwathmey Siegel & Associates Architects (GSAA) has received a LEED Gold certification. The 114,000 square foot building, constructed of cast-in-place concrete in the Brutalist style, was formerly known as the Art and Architecture Building. It was designed by then chair of the Department of Architecture, Paul Rudolph and completed in 1963. GSAA’s design results from the integration of programmatic, structural and mechanical needs. It includes the restoration of exterior walls, the installation of historically correct windows, and upgrades to all building facilities including the exhibition gallery, jury and studio spaces, study areas, and administrative and faculty offices. It also introduces new lighting and furnishings throughout, in many cases replicating the originals, and brings the structure into compliance with current building and fire codes.